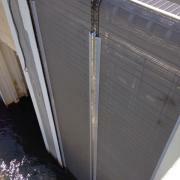 We provide system analysis, PE certified design, and in-house manufacturing (Maryland) of new and replacement Traveling Water Screen Systems. These are an enclosed system with a revolving belt used to remove and/or contain various types and sizes of debris from fresh or manmade water sources. We manufacture metal mesh belts with an opening size down to 1/16” (1.6 mm). 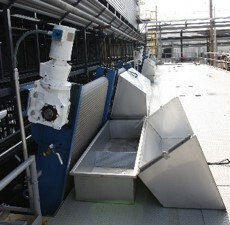 The belt lifts the debris from the water, and an internal self-cleaning system sprays debris off the belt and deposits it into a container or on to a conveyor system for disposal. Ask us about Impingement and Entrainment compliance associated with the Clean Water Act Regulations, Section 316(b).